Ahead of Tuesday’s decision by the Caribbean Court of Justice (CCJ) on whether presidential term limit is unconstitutional, Bharrat Jagdeo said he would not be giving up the position of General Secretary of the People’s Progressive Party. “I am moved to publicly assure that whatever the ruling is, I am and will remain the General Secretary of the PPP. In that capacity, I will continue to spearhead the Party’s struggle for a better life for all Guyanese, especially the working people, the poor and the under-privileged, for racial and national unity and for victory at the polls at the next Local Government, Regional and National Elections” said Jagdeo who is also a former Guyana President. Though he has sought to downplay speculation that he is the architect behind Cedric Richardson’s constitutional challenge, it is widely believed that Jagdeo is interested in running for the presidency again. He was twice elected in 2006 and 2011. 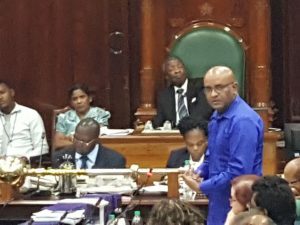 Jagdeo, who is now Opposition Leader, has also made it clear that he would be a PPP candidate in the 2020 elections and if his party is elected, he would be a minister. “Unlike the 2011-2015 period, where I played no formal part in the PPP Administration, I intend to be a formal part of the next PPP government as we resume the implementation of plans to build a better country of which all our people can feel proud,” he said. Although party insiders believe that Jagdeo has been playing dominant role and has formed his own clique against the established old guard, he on Saturday suggested that the politics was not about him. “Ours is a Party not built on personalities but on policies, all designed to create a better life for our people, and forge racial, ethnic and class unity. I remain committed to these policies and causes and will continue to struggle with the Party to achieve them,” he said. The former Guyanese leader said he was moved to issue a statement after “multitudes of supporters” and persons from “across the political divide” contacted him about the implications of the CCJ ruling scheduled for 2 PM on Tuesday, June 26, 2018. He said he remained humbled and eternally grateful to Guyanese for their support. The applicant, Cedric Richardson, had argued in Guyanese courts that that section of the constitution could not have been amended by Parliament to provide for a presidential term limit, but should have been done by a referendum. to the Guyana Constitution that altered the qualification to be elected as President of Guyana. Among other things, there was an amendment which prohibited candidates who had served two presidential terms of office from serving a third term. The Guyana Court of Appeal had ruled, by a majority of 2-1 with the present Acting Chancellor dissenting, that that the amendment indirectly breached Articles 1 and 9 of the Constitution which Articles entrench the concept that Guyana is a secular, democratic state in which sovereignty belongs to the people of Guyana. Mr Richardson had earlier successfully argued in the Guyanese courts that the amendment breached his right to elect a President of his choice.